Want to instantly identify all the classic gaming nerds at a party? Introduce yourself as “Guybrush Threepwood, Mighty Pirate” and just follow the squeals of gleeful delight. Without a doubt, Monkey Island is one of the most famous and best-loved series to come out of the Sierra/LucasArts golden age of adventure gaming. 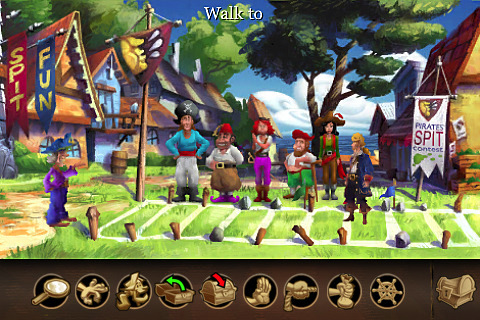 After the smash revival of The Secret of Monkey Island in the App Store, it was only a matter of time before the equally well-loved sequel followed on its heels. Monkey Island 2 picks up right where The Secret of Monkey Island leaves off, but you don’t need to have played the first to know what’s going on. All you really need to know is that there’s a hero, Guybrush Threepwood, his flame-haired love interest, Governor Elaine Marley, and Guybrush’s undead nemesis, the wicked pirate LeChuck. Beyond that, all you really need is an adventuring spirit, a tolerance for cheesy humor, and a head for unconventional solutions. Suffice to say, you’re in store for a grand, epic adventure, filled with swashbuckling, romance, and plenty of puzzles. Now, this special edition truly goes down a treat, especially if you were a fan of the original. There’s always the option to play in “Classic mode” for those who prefer to bathe themselves in the warm embrace of pixelated nostalgia, but the default mode includes gorgeously remastered graphics and full glorious voicework with the original cast! All of this combined with the exceptionally witty writing and clever puzzles of the original pushes this Special Edition well past happy memory territory into a genuinely enjoyable game by today’s standards. The updated interface has also been beautifully streamlined, requiring only a few intuitive taps to get around, a big improvement over the cursor drag of the first version. One of the nicest features included is a simple two-fingered tap to reveal all of the interactive points on the screen, a small, but indispensable time-saver. And should you get really stuck, the original, very gradual hint system is one of the best around. Suffice to say, I was very impressed by this beautifully remastered port, but a few persistent glitches prevent me from giving it my full seal of approval. Although the autosave function does a stellar job at protecting your progress, the game crashes and freezes frequently enough to be noticeable. Hopefully future updates will address these stability issues, but until then, expect a few technical hiccups now and again. Slightly buggy or not, that shouldn’t prevent you from getting this game. At $7.99, it’s definitely on the high side for an app, but this is one of the very best games available in the App Store, with brilliant characters and top notch writing that rivals some of the best games of all time, on any system. If you’re a fan of the original, this should be a no-brainer, but if you’re on the fence, give Monkey Island 2 a try and prepare to be completely blown away. 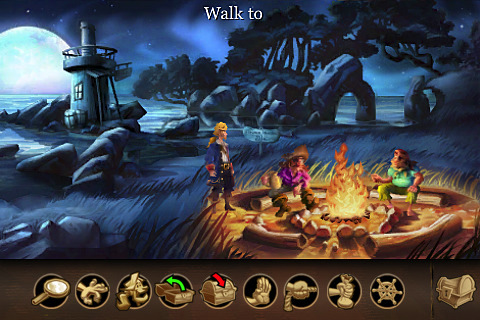 AppSafari review of Monkey Island 2 Special Edition: LeChuck’s Revenge was written by Tracy Yonemoto on August 6th, 2010 and categorized under Adventure, App Store, Featured, Fun, Games. Page viewed 4579 times, 1 so far today. Need help on using these apps? Please read the Help Page.